Focusing on the prevention of illness and injury in sport. This year, the conference will be held at the Vail Marriott Mountain Resort and includes a distinguished group of world-renown speakers. This symposium is in partnership between the Steadman Philippon Research Institute and the United States Coalition for the Prevention of Illness and Injury in Sport and provides attendees a tremendous opportunity to interact with today’s leading sports medicine researchers, orthopaedic specialists and other noteworthy healthcare providers. Such speakers focusing on the prevention of brain injury in sport include Dr. Comstock of the Colorado School of Public Health, Dr. Kathryn Schneider of the University of Calgary, Dr. Jeff Kutcher of the Sports Neurology Clinic, and Dr. Chad Prusmack of the Rocky Mountain Spine Clinic among many others. Registrants receive access to all speaker sessions; Wednesday welcome reception; Thursday breakfast, lunch and cocktail reception and Friday breakfast, lunch and closing reception. 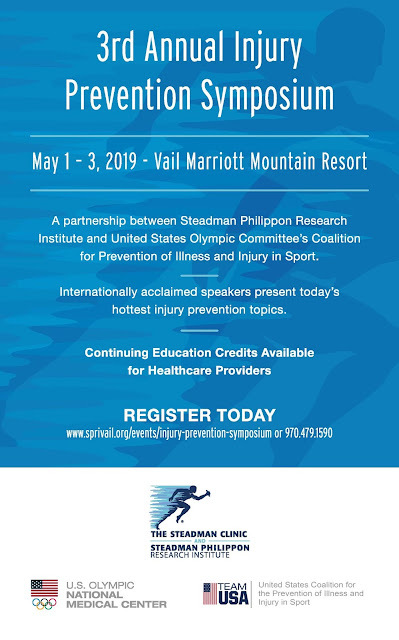 Access this link to register and to see the speaker list - https://www.sprivail.org/events/injury-prevention-symposium. A discounted student rate is available.